This hopper is used for ointment tube filling per pose with 25 liters capacity. Upper part of hopper is round while lower part is the conical shape with narrow ends. Inner part of hopper is made with 1.5 mm 316L Stainless Steel external part is made with 15mm 304 Stainless steels. Inner finishing of hopper is mirrored and external finish of hopper is matted. Material Detail: Main Body Made by 1.5mm thickness and Products. Contact Parts are made with 1.5/2.5 mm thickness & SS 316 quality. 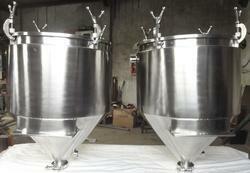 Category: Stainless Steel Fabrication / Hopper Fabrication. Capacity: 5L,10L,15L,20L,25L,30L,35L,40L,45L,50L. Material Detail: Main Body Made by 1.5mm thickness and Products. Contact Parts are made with 1.5 mm to 2 mm thickness & SS 316 quality. Fabrication Detail: Inner finishing of hopper given mirror for excellent mechanical properties and to avoid corrosion effect. Outer finish of hopper given glossy or mat finish or as per customize requirement. Hopper is precisely design and made with physically airtight and high filling accuracy. Hopper outer cone bore size is 100 mm and inner cone bore size is 40mm skillfully fabricated by manual work in our in house fabrication shop. Hopper lid is also manually formed and fitted with lid clamp arrangement for airtight arrangement. Certification: Material Test Certificate, Hydrostatic Pressure Test, Air Leak Test. Usage: Pharmaceutical, Food Processing, Cosmetic and Packaging Machinery. Approval: Inspection from our side on client request or third party inspection allowed. Looking for Jacketed Hopper For Four, Six and Eight Head Machine ?